Keep your dog busy with a delicious snack that small dogs love to chew. New PEDIGREE® JUMBONE® Minis are made with added vitamins and minerals, are high in fibre, low in fat, and have a meaty centre wrapped in a chewy outer later your dog will love. PEDIGREE® JUMBONE® Long-lasting Chew for Toy and Small Dogs is rated 4.5 out of 5 by 53. Rated 5 out of 5 by STACEYSON_337162589 from Our pets really love sampling new products. The jumbone treats are a just the right size for small dogs. As a special treat they seem to provide a chewy alternative to hard crunchy biscuits. My dogs enjoyed the texture and I approve of the time it takes to eat them. I would recommend these treats as an addition to regular treats or as a special occasion treat. Rated 4 out of 5 by KATHY_CON_337185117 from Product was very fresh, package well and dogs were excited. I had to break the jumbone in half for the dogs to take it. I have a shitzu and bichon. If the jumbone is not eaten right away, put it back in the bag. I left one on the counter overnight and it became very hard. My little ones are older and they can not chew hard treats. Rated 5 out of 5 by WENDYBON_337182432 from My dog gets a special treat when I come home from being out on weekends and these fit right in. His excitement goes to enjoying his treat and he calms down as he munches away. And I appreciate the calmer greeting when he is done. It's a win all around! Except for maybe when he wants seconds and realizes it doesn't work that way! Rated 5 out of 5 by Sandyyoung from Great packaging and photo My 2 shitzus love this ,its probably their favorite, they smell the treat first then immediately take it, all other treats they seem to hesitate a bit before they take it. Rated 4 out of 5 by SERENAGON_337155943 from My dog loved this product so much I went out and got him more. It enjoyed chewing on it for awhile which is odd for him since he eats everything quick. I will definitely but it again. Rated 4 out of 5 by LAJKON_337188401 from It was the perfect size for my small dog and he loved the flavour. As soon as I gave it to him he took it to the the corner and started chewing on it until it was done. Rated 5 out of 5 by COLTONWAB_337181944 from My dog liked these treats very much. Although true, it says they are not recommended for dogs under 5 pounds. She is 4. So I cut them each in half. She loves the taste. Not suitable for puppies or dogs under 2.3 kg (5 lbs). 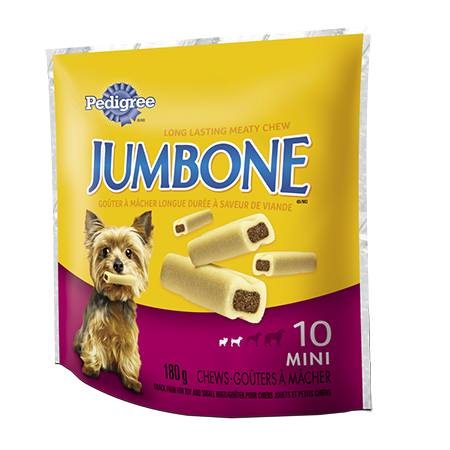 Each JUMBONE® Mini snack provides approximately 15% of the daily energy needs of a 6.8 kg (15 lb) adult dog. Therefore, your dog's main meal should be reduced accordingly. RICE FLOUR, GLYCERIN, SUGAR, WHEAT FLOUR, PROPYLENE GLYCOL, CELLULOSE POWDER, SODIUM CASEINATE, NATURAL POULTRY FLAVOUR, CALCIUM CARBONATE, SODIUM TRIPOLYPHOSPHATE, DRIED MEAT BY-PRODUCTS, POTASSIUM CHLORIDE, SALT, DICALCIUM PHOSPHATE, POTASSIUM SORBATE (A PRESERVATIVE), VITAMINS (CHOLINE CHLORIDE, d-CALCIUM PANTOTHENATE, VITAMIN B12 SUPPLEMENT, VITAMIN A SUPPLEMENT, NIACIN, RIBOFLAVIN [VITAMIN B2], PYRIDOXINE HYDROCHLORIDE, [VITAMIN B6], VITAMIN D3 SUPPLEMENT, THIAMINE MONONITRATE [VITAMIN B1], FOLIC ACID, dl-ALPHA TOCOPHEROL ACETATE [SOUCRE OF VITAMIN E], ZINC OXIDE, COPPER SULFATE.